We are always looking for dedicated people and smiling faces to be members of the Krasl Art Center crew. We have many volunteer opportunities for you to make a difference and match your interests. You will meet new people, discover others who share your interests and have fun while supporting the arts. If you have questions about volunteer opportunities please contact volunteer@krasl.org. Otherwise, apply to volunteer today! Are you interested in learning about art, interacting with the youth of our community and working with a dynamic group of people? 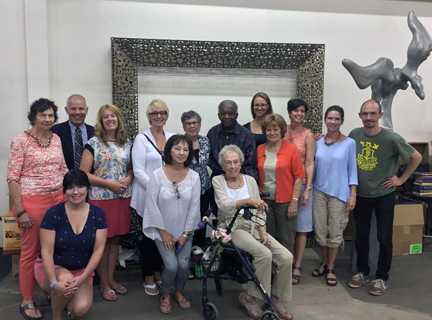 Become a volunteer docent at the Krasl Art Center! See the details below and email your completed Volunteer Docent Application to education@krasl.org today! What is a volunteer docent? A docent is a trained museum guide. The KAC has a variety of tours that require docents, including gallery tours, outdoor sculpture walking tours, and special event tours. Docents must be knowledgeable, enthusiastic, and comfortable working with diverse groups of children and adults. The KAC education department provides weekly 1 hour training sessions that cover art history, cultural sensitivity, public speaking, and teaching strategies. Occasional field trips and artist lectures are also included in the training. Training sessions are held on Wednesday afternoons from 12-1 pm. Tours are typically scheduled between 9 am and 5 pm on Mondays, Wednesdays, Thursdays and Fridays. There are occasional weekend and evening time commitments. Why would I do this for free? Most museum docent programs are led by volunteers with a passion for teaching and learning about art. Docents benefit from a free and intensive education in the arts and the opportunity to share that education with others. In addition, volunteer docents enjoy KAC membership, invitations to special events, and one free KAC class per session. Download the Volunteer Docent Application and email the completed form to education@krasl.org or drop off a hard copy at the reception desk. You will receive an email confirmation, and the upcoming training schedule. You and your company can bring a wide range of programs to the community through a sponsorship at the Krasl Center for the Arts. As a sponsor you and your company will be recognized in media and KAC events throughout the year. You will also have access to a number of unique benefits. Please see examples of publicity and benefits below then contact Dee Hodgson, Development manager at dhodgson@krasl.org or 269.983.0271. Clients and employees (up to 50) will enjoy an invitation only Preview Party. Meet the curator who will provide insight into the exhibition. This privately catered event includes wine and hors d’oeuvres free of charge. 8 reserved tickets to the 98.3 Coast Smooth Jazz Concert. Krasl Art Center will place company name and logos on all printed material produced for their selected exhibit. This includes an oversized banner placed outside the Krasl Art Center for the duration of the exhibit. Ability to use the exhibition sponsorship in your own promotions.